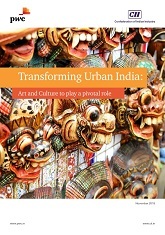 This report makes an effort to understand the enablers of art and culture driven economic growth and to learn from the best practices of some successful international and Indian cities. It takes into account the current schemes and initiatives put forth by the Government of India. Additionally, we have also identified pertinent challenges being faced by Indian cities in this regard. The report also shares the viewpoints of industry stalwarts. What comes out from these, is the need to bring greater investment into the sector, from both public and private players. Finally, the report provides a roadmap on how to build sustainable cultural megacities. It was jointly published by CII and PwC, unveiled at the CII Seminar on Arts and Culture 2018 at held on 28 November 2018.